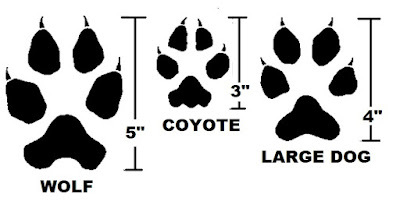 This is Predator Identification Part Three -- Coyotes, Wolves, Canine, and Foxes. 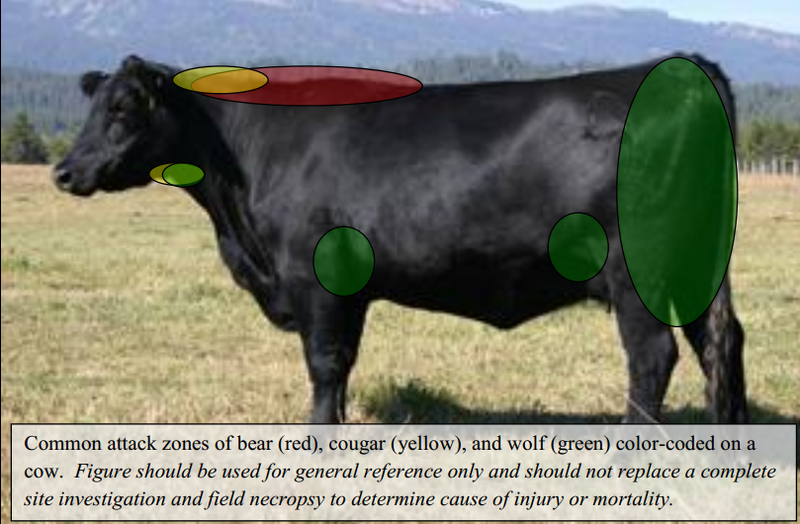 As with Part One and Two, this is just a fairly brief description of how to identify what sort of predator attacked and/or killed your livestock. I really hope the information below helps you. Coyotes normally kill livestock with a bite in the throat, but they infrequently pull the animal down by attacking the side, hindquarters, and udder. The rumen and intestines may be removed and dragged away from the carcass. On small lambs, the upper canine teeth may penetrate the top of the neck or the skull. 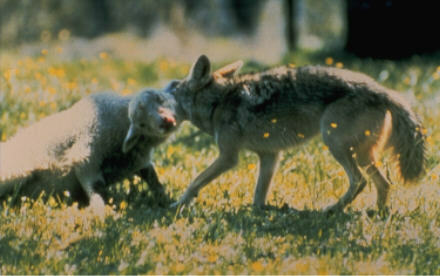 Calf predation by coyotes is most common when calves are young. Calves that are attacked, but not killed, exhibit wounds in the flank, hindquarters, or front shoulders; often their tails are chewed off near the top. Deer carcasses are frequently completely dismembered and eaten. Drip irrigation system users report that coyotes chew holes in plastic pipe and disrupt irrigation. Coyotes damage watermelons by biting holes through the melons and eating the centers out; raccoons, on the other hand, make small holes in the melons and scoop the pulp out with their front paws. Coyotes will also damage other fruit crops. Wolves prey on larger ungulates such as caribou, moose, elk, and cattle. 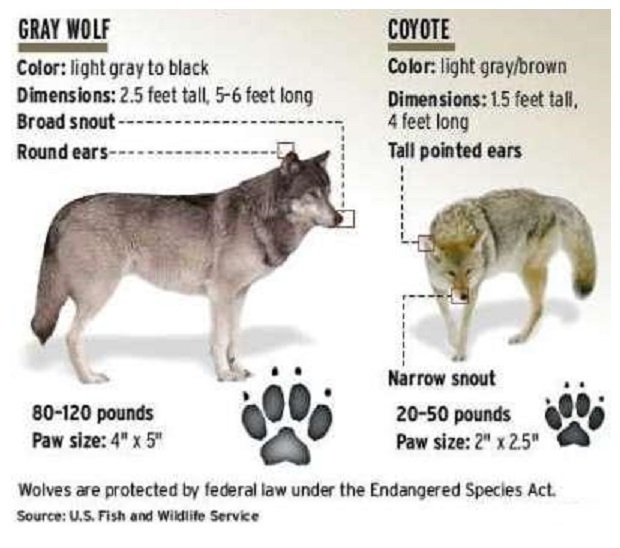 Wolves usually bring down these animals by cutting or damaging the muscles and ligaments in the back legs or by seizing the victim in the flanks. Slash marks made by the canine teeth may be found on the rear legs and flanks. The downed animals usually are disemboweled. Domestic dogs can be a serious problem to livestock, especially to sheep pastured near cities and suburbs. Dogs often attack the hindquarters, flanks, and head of livestock. They rarely kill as effectively as coyotes. Normally, little flesh is consumed. Dogs are likely to wound the animal in the neck and front shoulders; the ears often are badly torn. Attacking dogs often severely mutilate the victim. Coyote and dog tracks are similar but distinguishable. Dog tracks are round with the toes spread apart. Toenail marks are usually visible on all toes. Coyote tracks are more rectangular and the toes are closer together. If any toenail marks show, they are usually of the middle toes. Coyote tracks appear in a straight line whereas those of a dog are staggered. Gray and red foxes feed primarily on rabbits, hares, small rodents, poultry, birds, and insects. They also consume fruits. The gray fox eats fish, a prey seldom eaten by the red fox. 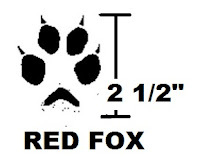 Gray and especially red foxes kill young livestock, although poultry is their more common domestic prey. Foxes usually attack the throat of lambs and birds, but kill some by multiple bites to the neck and back. Normally, foxes taking fowl leave behind only a few drops of blood and feathers and carry the prey away from the kill location, often to a den. Eggs are usually opened enough to be licked out. The shells are left beside the nest and are rarely removed to the den, even though fox dens are noted for containing the remains of their prey, particularly the wings of birds. Breast and legs of birds killed by foxes are eaten first and the other appendages are scattered about. The toes of the victims are usually drawn up in a curled position because of tendons pulled when the fox strips meat from the leg bone. Smaller bones are likely to be sheared off. The remains are often partially buried. Foxes will return to established denning areas year after year. They dig dens in wooded areas or open plains. Hollow logs are also used. Dens may be identified by the small doglike tracks or by fox hairs clinging to the entrance. The gray fox is the only fox that readily climbs trees, sometimes denning in a hollow cavity. In general predators are rarely observed. Because of this, the accurate assessment of losses to specific predators often requires careful investigative work. One's first move to determine what it was that attacked and/or killed your livestock, one must determine the cause of death by checking for signs on the animal and around the kill site. Check for the size and location of tooth/talon marks will often indicate the species causing predation or at least eliminate certain species from suspicion. Typically, hair/feathers will obscure the attack site. Some say that ideally, the victim may need to be skinned in order to investigate the attack site properly. When investigating a kill, always consider the time of day the predator attack occurred. Extensive bleeding usually is characteristic of predators. Where external bleeding is not apparent, the hide can be removed from the carcass, particularly around the neck, throat, and head, and the area checked for tooth holes, subcutaneous hemorrhage, and tissue damage. Hemorrhage occurs only if skin and tissue damage occurs while the animal is alive. Animals that die from causes other than predation normally do not show external or subcutaneous bleeding, although bloody fluids may be lost from body openings. Livestock losses are easiest to evaluate if examinations are conducted when the carcass is still fresh. Animals may not always be killed by a throat attack, but may be pulled down from the side or rear. Blood is often on the sides, hind legs, and tail areas. Calves can have their tails chewed off and the nose may have tooth marks or be completely chewed by the predator when the tongue is eaten. Tracks and droppings alone are evidence that a particular predator is in the area and when combined with other characteristics of depredation -- it can help determine what predator is causing the problem.